Last week, I introduced you to UW Blink, the archetype I brewed on stream with Spell Queller from Eldritch Moon. In that article, I discussed my philosophy behind the deck, analyzing card choices and discussing particular interactions Spell Queller has with the deck and the format in general. I was then, and still am, convinced that UW Blink will grow to become a steady force in the format. Whether it takes a week, a month, or a year, Spell Queller in Modern is the real deal, and I intend to stay on the frontlines, innovating and adapting. Today, as promised from last week, I’ll be taking a deeper look into the archetype. I’ll go over specific matchups and finer points, as well as highlight the progression from my original list to my current configuration. Let’s get to it! This is the list I originally brewed and took to a 5-0 finish in my first Modern League, along with an overall starting record of 11-3. Initially, I was looking to try out a few different cards in the “three-drop value” slot, hence the singleton Eldrazi Displacer and Vendilion Clique, with Kitchen Finks in the board for specific matchups. During the brewing process I suspected Ojutai’s Command would end up being the worst card in the starting 60, but I wanted to try it out regardless. Given that the rest of my deck was pretty linear, a modal spell that gave me a bunch of options and would never be truly dead was pretty alluring. Returning a Wall of Omens and drawing a card (plus the card off the Wall) after an opponent spent time and mana casting Terminate on it felt pretty good, and even just getting back a Snapcaster Mage to grab another Path to Exile felt strong as well. Maindeck lifegain against burn and racing situations was very welcome, and the ability to counter a creature meant Ojutai’s Command would be able to interact against most decks in the format in at least some fashion. In practice, Ojutai’s Command did a lot, but just wasn’t worth the mana. While countering a Thought-Knot Seer or Reality Smasher was nice, most other decks in the format either played creatures that were way cheaper than Ojutai’s Command (making it very clunky), had ways around it (Cavern of Souls/Aether Vial), or I didn’t care to counter their creatures anyway. When Wall of Omens is clogging up the ground, countering creature spells isn’t really what I want to be doing with my mana. Thus, this card immediately felt like a four-mode spell that I was really only getting three-modes worth of value out of most of the time. As I said above, having maindeck lifegain against burn and racing situations was another big draw to my initial interest in the card. In practice, however, I found that my matchup against Burn was better than expected (thanks in large part to Spell Queller), and against other decks in the format I was usually winning races in Usain Bolt fashion (read: quickly and easily). When Restoration Angel blinking Wall of Omens can Fog a Tarmogoyf for multiple turns, usually I was winning races with a solid life total left. Situations have come up where four life would have been the difference, but not enough to justify Ojutai’s Command definitively. Finally, the return option was nice, but rarely worth justifying the four mana I was paying for it. With only seven two-drops in the maindeck, I’m not really an Ojutai’s Command deck. Were I splashing black for Tidehollow Sculler I could definitely see revisiting Ojutai’s Command, but I knew the card was underperforming in that slot and there were other spells I was trimming to fit it in. Eldrazi Displacer started as a singleton and quickly impressed me in almost every matchup. Flashing in and exiling our own creature as a more expensive Flickerwisp in response to removal gave it a lot of utility, and just threatening to blink Wall of Omens repeatedly played well into our draw-go style of gameplay. Pass the turn, hold up Spell Queller, opponent doesn’t play along, blink Wall of Omens and draw a card. A lightning rod for removal, Eldrazi Displacer often cleared the way for Spell Queller by taking a Lightning Bolt that my opponent might have held had I played a Flickerwisp instead. In grindy matchups like Jund and Jeskai, Displacer was an all-star, demanding an immediate answer lest it win the game by itself. Four colorless sources in the list to activate the singleton Displacer felt like enough, but I quickly swapped a basic Island out for an Adarkar Wastes in testing, bringing the total up to five. The deck only requires double blue for Vendilion Clique or Snapcaster Mage on Serum Visions, so often just a Hallowed Fountain or Celestial Colonnade satisfied my blue requirements for the whole game. The ability to fetch basic Plains and cast all of our spells, even with a bunch of colorless sources, makes our manabase smooth and painless. Of the few times I drew Moorland Haunt, it was significant about 50% of the time. Against an Affinity player on a Signal Pest/double Inkmoth Nexus draw, Moorland Haunt was great, giving me a few Spirit tokens to trade with his creatures and guarantee victory. Against Jund, having an extra creature to buy time against Tarmogoyf or rack up 3-4 damage was nice, but not game-winning by any stretch. Usually, I had more than enough things to do with my mana thanks to the value engine of Wall of Omens/Flickerwisp, and Moorland Haunt sat on the bench ready to chip in but ended up never needed. There’s nothing particularly wrong with the card; it just isn’t necessary. Rather, Ghost Quarter overperformed. Against Tron (a horrible matchup) Ghost Quarter is necessary for victory, and even then the matchup can be tough. Like Jund, it’s possible we just want to give up the Tron matchup, as Tron isn’t really a good choice for this metagame and has largely disappeared as a result. But I feel that with a bit of tuning we can get up to 40% or possibly even better. Outside of the Tron matchup, Ghost Quarter was great format-wide, killing Inkmoth Nexus out of Affinity and Infect and punishing Death’s Shadow Zoo for playing no maindeck basics. For the sideboard, Gideon Jura was rarely brought in and quickly abandoned. In theory, it’s a flexible threat that adds to the board without getting swept up in Supreme Verdict, aids in races with the must-attack clause, and acts as spot removal to boot. In practice, I rarely wanted to bring it in, as it was expensive and didn’t seem to help us in the areas where we are weak. Infect has a tough time ever beating this card if it lands, but playing into their Negate was not something I wanted to do. Against Eldrazi, we really only fog them for a turn, as they can build up large, powerful boards. Sitting back and popping their Thought-Knot Seers one by one sounded fun, but I never got to that point. A noncreature against control and Jund is solid in theory, but those matchups ended up being solid enough that I didn’t need it. After a lot of thought, and around 30 matches of tuning, this is where I’m at currently with UW Blink. As explained above, Ghost Quarter has been upped to fight against Tron specifically, and the field in general, and Eldrazi Displacer has been increased as well. Vendilion Clique is fine but unspectacular so it remains. I’m thinking about cutting it for the second Kitchen Finks, which both frees up a sideboard slot and replaces some of the maindeck lifegain lost from the removal of Ojutai’s Command. One of the Dispels became a Negate, to help a bit more in the Tron matchup specifically, and Supreme Verdict was added to help against Elves and Eldrazi. It might seem like a nonbo to include Supreme Verdict in a deck with 23 creatures, but it isn’t until you play with the deck that you see how swingy Verdict can be in the matchups where we want it. Left to our devices, most creatures we cast replace themselves, so while killing our own creatures isn’t a good idea, it isn’t devastating in the normal sense. Most matchups against Eldrazi devolve into racing in the air while they attempt to put as much power on the board as possible, and in many situations a Supreme Verdict can just end the game on the spot. In one match, my Eldrazi opponent sacrificed a Thought-Knot Seer and tapped two Eldrazi Temple to flash in Elder-Deep Fiend, which was horrible enough that I don’t want put myself in that position ever again. I would much rather play my game, draw some cards, buy some time, and wipe my opponent’s board once he’s dumped his hand and go from there. Supreme Verdict also does work against Elves and Merfolk, two other fairly difficult matchups. Against all three decks, Worship is an all-star as well. So it’s possible I just want to be playing more Worship, but I’m hesitant to go all-in on that card just yet. Merfolk can still kill us with Vapor Snag, and I’m not familiar enough with my opponents’ board plans against me to know if Worship is truly a bomb they can’t deal with, or just a card they can answer eventually. I imagine the Verdict should just be another Worship, but I’d like a few more games of testing before I pull the trigger. At a macro level, UW Blink grinds through most of the reactive decks in the format and stalls most of the aggressive decks. It struggles against combo archetypes, as they blank a large portion of our removal and blockers, and capitalize on our relative slowness to kill. As a result, in my opinion the deck positions itself similarly to Jund, thought it trades the access to discard and “game against everything” characteristic for a more focused gameplan and better points in specific matchups. Where Jund offers a lot of power and strength against everything, it suffers from bad draws in the lategame, the weakness of “drawing the wrong half of its deck,” and few outstanding matchups. In exchange, UW Blink offers a lot of consistency and power, invalidates the other reactive decks, and is able to focus strongly on a few specific matchups, in exchange for an inherent weakness to combo. This is important to realize, as the case is quickly being made for adding Meddling Mage, or black for Tidehollow Sculler and discard, to shore up our combo weakness. Currently 9% of the online metagame, Jund has grown in popularity in response to the increase in play of Death’s Shadow Zoo and Jeskai Nahiri specifically. We talked a lot about the Jund matchup last week, so I won’t go into it much more here, other than to say that our recent changes help the matchup even more. Ghost Quarter for their Raging Ravine along with more Eldrazi Displacer will help us grind much easier in the matchup, and this is one I’m confident in and happy to face all day. Currently my Jund opponents have been adopting a Fulminator Mage plan of attack, which probably isn’t great but can get us if we don’t fetch basic Island. So, fetch basic Island. Death’s Shadow Zoo can be difficult, given that they can kill on turn three and our deck is full of three-drops that are too slow on the draw. Winning the die roll definitely helps the matchup, but isn’t necessary for victory. Path to Exile is the one card they hate to see the most, and Wall of Omens can save us a bunch of life and make progress really hard for our opponent. One Mutagenic Growth is all they need to kill it, but remember that in that situation, we saved five damage, drew a card and made our opponent discard a card. If we can make it to our turn three we should be fine, as any number of plays like Snapcaster/Path or Spell Queller eating a Temur Battle Rage should guarantee victory for us. Death’s Shadow Zoo cannot beat a Worship or an Engineered Explosives, and getting to bring in Kitchen Finks, Dispel, Condemn, and Celestial Purge gives us a lot of interaction. I think this matchup is great but slightly worse than Jund. Mulligan non-interactive hands! Affinity is Affinity. Sometimes they get the Cranial Plating draw and hit us fast and hard, other times they get the Steel Overseer draw and make a huge board. For the most part, we have a bunch of interaction and ways to buy time, and once we get Eldrazi Displacer onto the board it is usually over. I’ve been thinking about trimming down on Stony Silence, if that says anything about my feelings on the matchup, but I probably won’t until I can play a solid ten-game set to really get a feel for the how the game flows. 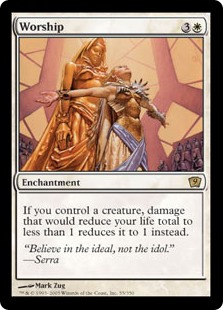 Affinity cannot beat a Worship either, and I think swapping the second Stony Silence out for a second Worship actually helps the matchup, and of course gives us points against the field. Stay out of Galvanic Blast range and you should be more than fine. Dredge is an interesting creature, as we can’t interact with any of the unfair things they’re doing, but they can’t interact with any of the fair things we do and our fair stuff seems more powerful. Wall of Omens and Restoration Angel are just better than a bunch of 3/3’s and 2/1’s. As long as we don’t die to a really quick draw, I am rarely scared about this matchup. They are priced into having to Conflagrate our board, but our toughness is so high they have to do so in such a way that they lose guys and open themselves up to blink effects. Rally the Peasants is worth mentioning, but in over ten matches against the deck online (with various decks of my own) they’ve cast that card once, and I had a Remand. I’m not too worried about it. They also cannot beat a Worship. On paper, Merfolk is probably a slightly unfavorable matchup, but with careful play we can get there. Islandwalk is potent against our plan of blocking with Wall of Omens, but we actually don’t play as many Islands as you would think. Without looking at the list, try to guess how many we play… Four. That’s not bad, and we can go the whole game without Island if we need to, either by luckily not drawing it or holding it in hand. With Celestial Colonnade, Glacial Fortress, and Mystic Gate giving us blue mana, we have more than enough ways to cast our spells, not to mention Aether Vial cheating them in. Since we’re UW, I’ve had a few Merfolk players even board out their Spreading Seas, making it even easier for us to block. Still, the matchup is tough, and they can Vapor Snag to kill us with a Worship out, but that’s another card they don’t really want to be casting against our deck. To this point, I’ve killed them with Worship twice and have yet to see a post-board Snag, so it’s possible they are boarding it out. Still, in that situation the one card I’m looking to draw into is Spell Queller to soft-lock them, which speaks to the power of the card. This matchup is tough because we’re priced into racing, but they can build a better board faster. Engineered Explosives, Worship, or Supreme Verdict to bring us back to parity is what we’re looking for here. UW Blink doesn’t do anything crazy, but what it does, it does consistently well. The whole deck is built around moving the game to a point where our opponent has to play into a blowout by Spell Queller or Flickerwisp, and if we can do that we’re in great shape. Wall of Omens is the glue that holds the deck together, and in matchups where it’s ineffective, we struggle. Currently, I’m happy to play against most of the decks in the field and consider myself favored against a bunch of the top choices. It is the state of Modern that we can feel strongly advantaged against Death’s Shadow Zoo and still lose horribly, but for the most part I’m happy to face almost every non-combo deck in the field. Currently, combo in Modern is at an all-time low, which is allowing a deck like UW Blink to shine. Maybe the board should be shifted to allow for a bunch of Meddling Mage, or perhaps we want to be adding black for a few options. For now, I’m doing well and making small tweaks, and loving every second of it! If you’ve been working on the deck, or if you have any questions/comments, stop by my stream or let me know below! Thanks for reading and I’ll see you next week. Seems like you’d have an awfully hard time activating Displacer with only three sources of C in the mana base, though. There are two Mystic Gates and three Ghost Quarters, for a total of 5 colorless sources. Good point, missed that. Whoops! Also, you can’t cast Elder Deep-Fiend off a TKS and two temples, you need UU. Worship is pretty terrible against Elves, It’s likely the deck I’ve played most against in all of modern since my main testing buddy loves the deck and wasting a whole turn casting a 4cc enchantment while tapping out is not where you want to be against a deck with 4 shaman of the pack, 4 Chord/4 CoCo to get them, and 3/4 canopy + 3/4 elvish visionary to draw into them. Shaman of the Pack and multiple ways to get it definitely changes the Worship plan. I was close to cutting the Verdict for another Worship, but this is making me want to keep the Verdict now. Thanks for catching this! Having played the spiritually similar white-blue D&T once upon a time, I recommend at least trying out Seachrome Coast as it fits nicely with your low-to-the-ground costs and requisite speed. Also, as an early adopter of the Eldrazi in that style of deck, I’ve found the Pain Lands tend to do more lifting than the Filter Lands overall, but YMMV. I like your counter suite, but if you find yourself looking for creature protection, you may want to look at Selfless Spirit. Decent clock plus as-needed protection is good. I do like Seachrome Coast, I think I’ll be trying out three instead of the Glacial Fortress and one Hallowed Fountain. Thanks for the suggestion! How do you feel about the non-BO of Path to Exile and Mana Leak? Since your deck is very tempo oriented, would it be better to play “Spell Snare,” “Remand”, or even the new “Unsubstantiate”? in it’s place? Also, while your deck is winning in a different way, have you seen Caleb Durwood’s take on Spell Queller in Bant Spirits (on CFB a few days ago)? He also 5-0ed a competitive league going more on the hexproof, disruptive tribal plan, but it was the best use of spell queller I’ve seen in action. Great to see more work on the deck! Personally I’ve been trying to explore the black splash, borrowing elements from Eldrazi and Taxes; processing a Quelled spell w/ Wasteland Strangler seems too sweet not to try. Ancestral Vision seems like an odd choice for this deck; I’m guessing it’s for grindy matchups against removal-heavy decks? It might be too cute, but I’d be curious how Ephara plays in that slot, or maybe a Mulldrifter for extra blinking shenanigans. As Ricardo noted, Worship plays poorly against Shaman of the Pack, as well as having weaknesses to Merfolk’s Vapor Snag and Affinity’s Inkmoths. Any consideration for Ghostly Prison or Windborn Muse vs. the swarm decks? Glen Elendra Archmage seems sweet in this shell, though it could be too slow vs. Tron to take Negate’s spot. Could it find a place here, or would you rather stick to blinking Snapcaster for late game counterspells? I made a similar deck a week ago that’s more death and taxes based, feel free to look thru it. Had good results with it so far.